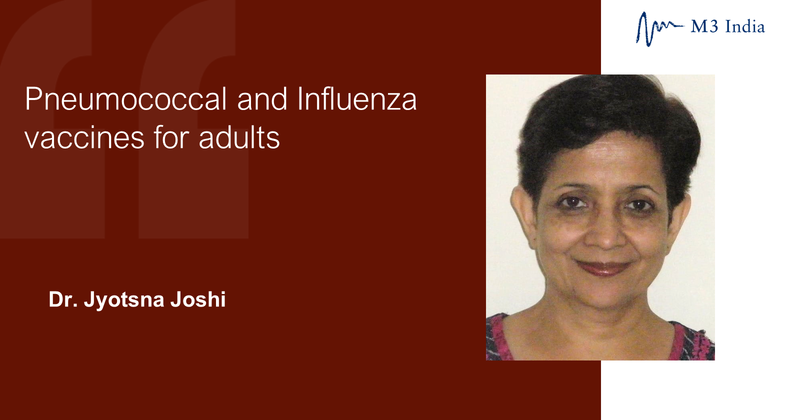 Prof. Dr. Jyotsna Joshi asserts the importance of preventive adult vaccinations, particularly pneumococcal and influenza vaccination and also throws light on the schedule for dual vaccination. Physicians treating adult patients have poor awareness of preventive vaccinations. Nevertheless, vaccination is an important aspect of management of respiratory disorders and reduces morbidity and mortality. Adult Respiratory Vaccination, particularly pneumococcal and influenza vaccination is very important and physicians need to be aware of these. 'Prevention is better than cure', is the best policy for disease management. Vaccination is an important intervention in the preventive strategy, but in the adult population, it is a much neglected subject. This article emphasises the adult respiratory vaccinations, that are given to prevent respiratory diseases or exacerbations of chronic respiratory disease. The two main vaccinations in this group consist of pneumococcal and Influenza vaccines. The recommendations are largely based on Advisory Committee on Vaccination Practices (ACIP) of the US Centers for Disease Control and Prevention (CDC). Pneumococcal infections, including pneumonia and invasive disease such as bacteraemia and meningitis, are important sources of morbidity and mortality in infants and young children, older adults (≥65 years of age), and persons with conditions that affect their ability to make antibodies to capsular polysaccharides. Patients with chronic lung disease are at increased risk for pneumococcal pneumonia, and patients with conditions such as heart failure are more likely to have adverse outcomes if pneumonia occurs. Asplenia greatly increases the risk for overwhelming pneumococcal sepsis, and a cerebrospinal fluid leak or a cochlear implant greatly increases the risk for pneumococcal meningitis. Pneumococcal vaccination is recommended for all children and for adults who have a condition that places them at increased risk for developing pneumonia or invasive pneumococcal disease or for having a serious outcome should pneumonia develop. Two types of pneumococcal vaccines are approved for use. Pneumococcal polysaccharide vaccine (PPSV; Pneumovax): It was first marketed in the 1970s as a vaccine that contained capsular polysaccharides from 14 pneumococcal serotypes that commonly caused disease. In 1983, this vaccine was augmented to include capsular polysaccharides from the 23 most commonly infecting pneumococcal serotypes and is marketed as Pneumovax 23 (PPSV23). At present, PPSV23 contains capsular polysaccharides from pneumococci that cause about 60 percent of all pneumococcal infection in adults. PPSV is used in selected adults and children ≥2 years of age but not in infants or toddlers <2 years of age since polysaccharide antigens are poorly immunogenic in this age group. Pneumococcal conjugate vaccine (PCV; Prevnar): It was initially marketed in 2000 as PCV7, a vaccine containing polysaccharides from the seven pneumococcal serotypes that caused most pneumococcal disease in young children. Because PCV7 is an excellent immunogen in infants and toddlers, it was adopted in the United States for universal use in this age group in 2000. In 2010, PCV7 was replaced by PCV13, a vaccine that has added serotypes commonly implicated in disease. PCV13 stimulated antibody to serotypes that caused 28 to 42 percent of invasive pneumococcal disease in adults. In countries with universal PCV immunization programs, this percentage is declining as a result of indirect immunity. The 23-valent pneumococcal polysaccharide vaccine has been recommended for many years in for all adults ≥65 years of age and in younger patients who have a condition that increases the risk for developing pneumococcal pneumonia or invasive pneumococcal disease and/or fatal complications if such infections occur. In 2012, the ACIP recommended sequential administration of both PCV13 and PPSV23 for individuals >19 years of age who are at substantially increased risk of serious pneumococcal infection, such as those with functional or anatomic asplenia, an immunocompromising condition (e.g. HIV infection), a cerebrospinal fluid leak, a cochlear implant, or advanced kidney disease. The ACIP does not recommend PCV13 for routine use in adults <65 years of age. The ACIP states that both PCV13 and PPSV23 should be given to adults of any age who have the underlying conditions listed below and to all adults aged ≥65 years. When possible, PCV13 should be given first, followed by PPSV23; the recommended interval between the vaccines varies by patient group. Asplenic individuals are at risk for overwhelming pneumococcal sepsis that may occur even in the absence of a focal infection such as pneumonia. Although the ACIP has not made a recommendation about vaccinating adults who have been diagnosed with invasive pneumococcal disease, all survivors of invasive pneumococcal disease may receive PCV13 followed by PPSV23. Even if they have not been diagnosed with one of the conditions listed above, they have proven themselves to be susceptible and, therefore, worthy of receiving the vaccine. The CDC recommends 2 pneumococcal vaccines for all adults 65 years or older irrespective of disease or immune status. Older adults should receive a dose of PCV13 first, followed by a dose of PPSV23, at least 1 year later. Individuals who have an indication to receive both PCV13 and PPSV23. Immunocompromised adults or adults who are at a particularly high risk for pneumococcal infections because of advanced kidney disease, functional or anatomic asplenia, a CSF leak, or a cochlear implant who are any age (including those ≥65 years of age) and who have not previously received either PCV13 or PPSV23 should receive a single dose of PCV13 followed by a dose of PPSV23 ≥8 weeks later. For individuals ≥65 years of age without any of the conditions described previously, PPSV23 should be given ≥1 year following PCV13 and at least 5 years after the most recent dose of PPSV23. For patients with an indication for PCV13 who have previously received one or more doses of PPSV23 but have not received PCV13, a single dose of PCV13 should be given if at least one year has elapsed since the last PPSV23 dose was given. For patients <65 years of age who require revaccination with PPSV23 (eg, immunocompromised patients), the first such dose should be given at least eight weeks after PCV13 and at least 5 years after the previous dose of PPSV23. Administration: Both pneumococcal vaccines are administered as a 0.5 ml dose. PPSV23 is administered intramuscularly (but subcutaneous deposition is adequate in obese patients). Intradermal administration can cause severe local reactions and should be avoided. Administration with other vaccines: Either formulation of pneumococcal vaccine may be given concomitantly with other vaccines. When more than one vaccine is given, they should be administered with different syringes and at different injection sites. 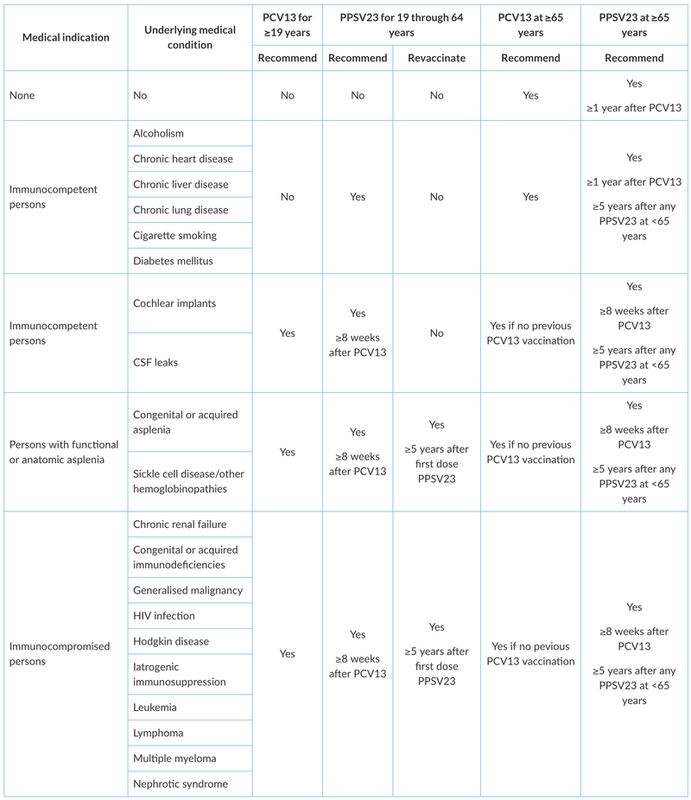 Concurrent administration of either PPSV23 or PCV13 with the inactivated influenza vaccine is safe and is unlikely to reduce the effectiveness of either pneumococcal vaccine.In patients who require both PPSV23 and PCV13, the two vaccines should be given at different times as outlined above. For most immunocompetent patients who received PPSV23 between ages 19 and 64, revaccinate with PPSV23 at age 65 (provided ≥5 years have elapsed since the last dose. ACIP recommends a subsequent revaccination dose of PPSV23 once an immunocompromised patient reaches age 65 but not at regular intervals thereafter. For adults with asplenia who have received both PCV13 and PPSV23, revaccination with PPSV23 every five years may be given. This recommendation is in accord with some European public health agency recommendations. However, it differs from the ACIP. Revaccination with PCV13 is not recommended for any age group. Although influenza is typically a self-limited illness, it may result in serious morbidity and mortality, especially in vulnerable populations such as older adults, very young children, pregnant women, and those with certain chronic diseases. Since 2010, the Centers for Disease Control and Prevention (CDC) and their Advisory Committee on Immunization Practices (ACIP) have recommended routine annual influenza vaccination for all persons without contraindications aged 6 months or older. A new version of the vaccine is developed yearly, as the influenza virus rapidly changes. While their effectiveness varies from year to year, most provide modest to high protection against influenza. CDC estimates that vaccination against influenza reduces sickness, medical visits, hospitalizations, and deaths. When an immunized worker does catch the flu, they are on average back at work a half day sooner. Vaccinating children may protect those around them. All adults need influenza vaccine every year. One can get the vaccine as soon as it becomes available or anytime during the influenza season. Adults with certain health conditions including heart disease, asthma, COPD, diabetes, a liver or kidney disorder, or a weakened immune system are at especially high-risk for influenza and its complications. For years, flu vaccines were designed to protect against three different flu viruses (trivalent vaccines). Trivalent vaccines include an influenza A (H1N1) virus, an influenza A (H3N2) virus, and one influenza B virus. Experts had to choose one B virus, even though there are two different lineages of B viruses that both circulate during most seasons. This meant the vaccine may not protect as well against the group of B viruses not included in the vaccine. Adding another B virus to the vaccine aims to give broader protection against circulating flu viruses. Dose (volume): 0.5 mL for children and adults 6 months of age and older. Persons aged 65 years or older may receive any age-appropriate IIV formulation (standard dose (SD) or high dose (HD), trivalent or quadrivalent) and vaccination should not be delayed if a specific product is not readily available. However, HD-IIV3 has been the most extensively studied in older adults, and evidence to date supports its superior efficacy and effectiveness compared with SD-IIV3 in persons aged 65 years or older. LAIV4 is administered intranasally using the supplied prefilled, single-use sprayer containing 0.2 mL of vaccine. Half of the total sprayer contents is sprayed into the first nostril while the recipient is in the upright position. The attached divider clip is removed and the second half of the dose administered into the other nostril. If the vaccine recipient sneezes immediately after administration, the dose should not be repeated. If nasal congestion impedes delivery of the vaccine to the nasopharyngeal mucosa, deferral should be considered, or another age appropriate vaccine should be administered. The best time to get vaccinated is in October before the start of the flu season in India, where it peaks in February and March. It takes about two weeks after vaccination for the antibodies to develop and protect against infection, and the effect lasts for about a year. No preferential recommendation is made for one influenza vaccine product over another for persons for whom more than one licensed, recommended, and appropriate product is available as per the ACIP. The ACIP continues to advise that individuals with a history of egg allergy of any severity may receive any licensed, recommended, and age-appropriate influenza vaccine (IIV4 or LAIV4). However, it is contraindicated in people who have experienced a severe (life threatening) allergy to a prior dose of a seasonal influenza vaccine (IIV or LAIV).